The Rise of the Wehrmacht is the first comprehensive work to deal with the German war effort in World War II from this point of view. Its uniqueness lies in the fact that it covers the entire war effort from the point of view of the German military that actually conducted and fought the war, something that has never been done before on this scale. Excellent books have been written about the German Army, Navy, the Luftwaffe, and the SS, as well as about the Panzer branch, the parachute arm, the U-Boat forces, etc., but this is the first to cover them all in depth. Mitcham also covers the German Wehrkreise (roughly translated as military district) system in depth and recognizes its importance, both in the formation and expansion of the German Army before the war and in its continuing importance throughout the conflict. 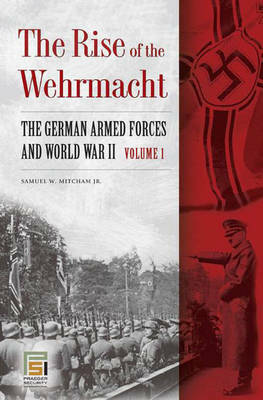 He deals with the German rearmament in greater depth and detail than has been done before, points out the importance of the police in the development of Germany's reserves before and during World War II, and offers new insights into the evolution and development of the German military doctrine of Kesselschlact (the decisive battle of encirclement and annihilation). In addition, The Rise of the Wehrmacht explains the problems the Wehrmacht faced because of its too rapid expansion. This expansion was far more rapid than the German generals intended and resulted in many problems, especially in terms of equipment shortages and a shortage of qualified officers. Finally, Mitcham addresses the contributions of the Hitler Youth to the war effort, where their work on farms, fire and rescue crews, in nursing, and as postal workers, for example, provided essential services to German infrastructure.